Steve G. Jones, Ed.D., Clinical Hypnotherapist, charges $1,500 for a custom recording and $25,000 for a one-hour private hypnotherapy session at his office. But you can get all the benefits for this low price. Simply listen to the Cope with Divorce (for Adults) Hypnosis MP3 every night as you go to bed for three weeks and feel the changes happening in your life. You will feel more empowered, more in touch with your true self, and you will truly know that your goals are within your reach. the effective Cope with Divorce (for Adults) Hypnosis MP3 session by Dr. Steve G. Jones! Steve G. Jones achieves AMAZING and LASTING results!!! Hypnosis is the easiest way to affect change in your life because the positive messages go straight to your subconscious mind effortlessly so you can accomplish your goals and reach for the stars!! All you have to do is listen to the Cope with Divorce (for Adults) Hypnosis MP3 download at night as you go to sleep!!! You’ll hear soft music, the gentle sounds of the beach, and the soothing sound of Steve G. Jones’ voice all working together to bring about positive changes in your life easily and naturally. Steve G. Jones has been helping people improve their lives with hypnosis for over 17 years…now it’s time for him to help YOU… don’t wait, do it NOW !!! you’ll be glad you did. See you at the top! Going through a divorce is a very difficult time. People put a lot of time, effort, and love into their marriage and when that ends there is a period of pain, grief, and readjustment. A lot of changes occur during this time such as getting used to not being in a relationship and living on your own. Divorce also means separating emotions and physical things. No matter who initiated the divorce, it is a difficult time for both people. However, if you are going through a divorce you must realize that with time, everything will be okay. You CAN cope with divorce. If you are going through a divorce it is important to have support from other people. You can and will get through this difficult time and you lean on others who love and care for you for support. It is important to realize that with a divorce come new opportunities. Divorce allows you to learn more about yourself physically and emotionally. Getting through the hard times will make you stronger. You are a strong person and you deserve to be happy in a relationship. I encourage you to remain strong and keep a positive attitude. And as you relax more and more you realize just how powerful you are. Your mind is very powerful and you are able to easily control your emotions. And you deal with any emotions immediately and efficiently and maturely, that’s right. You deal with any emotions easily and effortlessly and naturally, that’s right. And any outside stress that comes at you, bounces off and away from you, bounces off and away. And feel now any inside stress draining out of your body, through the bottom of your feet, that’s right. Feel that stress just draining away, that’s right. And you realize now that you are going through a process which many people have gone through various stages of the divorce process. You realize that you will sail through this process easily because you are calm and relaxed and you deal with your emotions in a very efficient and mature way. And if there are any children involved, you realize that you will be able to give them the appropriate amount of love during this process, that’s right. And even after the process, that’s right because you are now entering a new phase of your life, a new phase where you take direct control of your life and your able to help others. You have decided to enter a new phase of your life. You have accepted this change and you realize that all change is positive, that’s right, because it all has to do with your point of view and your point of view is positive because you allow your point of view to be positive. You are very kind to yourself, always. You treat yourself with respect, that’s right. And you are able to interact with the person you are divorcing in a very mature and respectful manner and this allows them to interact with you in the same way, creating a flow of energy in your life. Allowing you to easily, smoothly, quickly, and efficiently transition into the next phase of your life. So during and after the divorce process, you will be very relaxed, very calm and you will embrace the change, the positive change that is happening in your life and you will see new opportunities that are more exciting than the old ones, that’s right. Look now to the future and realize all the exciting opportunities for you. And if there are any children involved, realize the exciting opportunities that also await them. Entering this new phase of your life is very exciting and rewarding and you embrace change because you are a positive, optimistic person. So relax now and realize that everything is going to be just fine. Hypnotherapy is a very relaxing and encouraging form of therapy, which is exactly what you need when you are going through a divorce. Divorce causes a lot of stress and worry and this hypnosis recording will alleviate it. Divorce is a negative time in your life when all you need is encouragement, love, and support. This hypnotherapy recording will give you the encouragement and support you need to get back to living a fulfilled life. The Cope with Divorce (for Adults) Hypnosis MP3 recording will help you get through this difficult time. It will give you motivation when you need it. Hypnosis will give you confidence and strength. You need to get your sleep and relax when going to bed so that you can have days that are filled with production and happiness. Hypnosis is the perfect tool to help you cope with divorce. Divorce can take a lot out of you. Self-hypnosis targets so many different aspects of your well-being to help you get through this difficult time. Hypnotherapy is relaxing and full of positive and strengthening suggestions. The Cope with Divorce (for Adults) Hypnosis MP3 audio will give you the extra support that you need from yourself. You can and will get through this difficult time in your life. Hypnotherapy will help relieve your stress and help you see the positive things in your life. 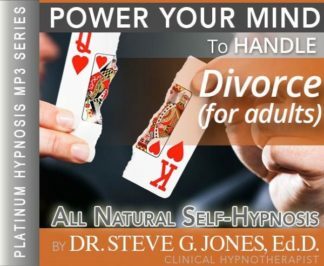 This hypnosis recording is specifically designed for adults who are going through a divorce. Steve knows just how difficult it is to go through a divorce. He uses is experience with hypnotherapy and his experience with divorce to give you a very powerful program to help you improve your life. You are strong inside and out. You are strong mentally, physically, and spiritually. This hypnosis program allows you to tap into your inner strength so that you can better cope with divorce.